My last article sparked some questions about my Brew Magic Mods. Below, you will find the two most requested, and parts list. Warning: If your Brew Magic V350MS is still under warranty, I do not recommend making substantial changes to the kettles. Most of the parts may be purchased at BrewHardware.com. Sadly, Bobby doesn’t carry the 1/2″ tri-clover fittings, but you can find them at BrewersHardware.com or from BrewMagic.com. I highly recommend both companies. I noticed that many people were using a segmented articulated hose to control wort return location and direction in a number of HERMS and RIMS designs. Out of curiosity, I bought a length and friction fitted it with a short piece of silicon hose to the 1/2″ inlet pipe on the inside of the Brew Magic Mash Tun. I was very happy with the performance, and it allowed me to place the output very precisely, without carving or channeling the top of the mash bed. When I started measuring DO uptake, I discovered that I needed an air tight connection, as that pipe inlet is typically above my mash volume. I measured with the friction fit silicon hose (as provided by Sabco), and could attribute about 1.5-2.0 DO increase during a 90 minute mash period. With the Loc-Line, fitted as mentioned before, I was still getting into the 1-1.5 DO uptake range. I had to find an air tight solution. A 1/2″ compression fitting with 1/2″ MPT threading. I bought mine here. A Loc-Line kit, such as this from BrewHardware.com. A 1/2″ to 1/2″ MPT female adapter. I had one lying around. PTFE plumbers tape. White or blue. I prefer the slightly thicker and wider tape for a more airtight fit. It is easier to put the compression fitting on the MLT if you can detach it from the stand, set on its side, and orient the inlet tube on the bottom. My compression fitting came with a stainless steel and nylon lock ring. I suggest using the nylon one. Simply slide the large nut on the tube, with the nylon lock ring, and then the body of the compression fitting. With two wrenches tighten the fitting. Be gentle, but firm, and do not over tighten. The fitting should not move or twist it at this point without a wrench. Use plumber’s tape on all threads. You only need enough to wrap the thread with a slight overlap. Then screw on the female 1/2″ adapter. You want this fully engaged; my adapter didn’t fully cover the threading on the compression fitting, but is on as far as the threads will allow. Next, remove the 1/2″ MPT to Loc-Line adapter; it snaps off with pressure. You can use an elbow adapter or a straight one. Both work equally well. Screw this into the female adapter using plumber’s tape. Then, re-attach the the Loc-Line. If you are having difficulty, use a thin smear of keg lube on the tube to help it along. It will snap into place. Now you have full control of your mash return hose. I position mine at the bottom of the tun for grain-in to underlet the mash with a slow gentle pump from the HLT. Then I reposition it about an inch below the mash water for circulation. Whirlpooling is a standard practice to settle hops and trub. Since I replaced my false bottom with the perforated ring, the whirlpool made more sense, as I was loosely bagging my hops. I was also concerned that stirring would splash too much and take up oxygen. Since I already had a pump on the Chill Wizard, I decided to add a three-way valve, and use the pump to whirlpool. This allows me to both quickly drop the temperature to below 140F (to prevent SMM formation) and adequately spin down any break material. I run for 5-10 minutes, then stop and let the kettle settle before final chilling. Again, let me warn that this will likely invalidate your Brew Magic warranty, and requires drilling a hole in the kettle. A 14″ weldless whirlpool arm assembly. I got mine from Bobby at BrewHardware.com. This is a newer version of the one I bought. Follow the instructions. A 1/2″ Ball Valve, with 1/2″ tri-clover fittings. I like these. This is for flow control. (2) 1/2″ tri-clover BUNA gaskets and clamps, just like what you have already. A step drill bit. I marked mine with a sharpie. A rasp or round file. Note: I like having extra and compatible parts so I chose to stick with 1/2″ tri-clover fittings. This will work fine with any fittings you prefer. Locate where you want to add the whirlpool arm inside, considering where the dip tube and other bits are located. I wanted the outlet low enough to prevent splashing or surface turbulence. Using a sharpie marker, I marked around the arm fittings. I triple checked this, making sure I had room under the kettle’s lip to tighten things down properly and not interfere with the dip tube. I transferred this position to the outside of the kettle. Find a secure location to work, and stabilize the kettle on its side, taking care to not damage any of the ports. I removed the site glass and thermometer to protect them. Take your set punch and firmly dimple the center of where you wish the hole to go. This may take a few hard strikes to dimple, the kettle is really strong. Look inside to confirm the dimple shows centered to where you marked your fitting. If this is good, proceed. Wearing eye protection, put a little lubricant on the spot and bit, and start drilling. Add more lube as the drilling starts to generate smoke. Go slowly and carefully with firm pressure. Keep a few ice cubes or a cold rag and cool off the work every few minutes. Your step bit will drop once each step level is cleared – so don’t get surprised. Once you have created a 13/16″ hole stop drilling. Run the drill again carefully from the inside to remove burrs. A round file can also help to knock down any rough edges and some fine sand paper to smooth. Dry fit the coupling along the way so it just fits without threading through the keg. Clean up the oil and steel shavings carefully. I suggest wearing gloves. Assemble the whirlpool arm per the vendor instructions, and tighten down using PTFE plumber’s tape on all threads. Add the tri-clover fitting to the 1/2″ MPT outlet, then clamp on the ball valve. Then you can attach a pump outlet to circulate. Give it a wet run with StarSan or SaniClean, making sure to clean out any remaining lubricant or shavings. 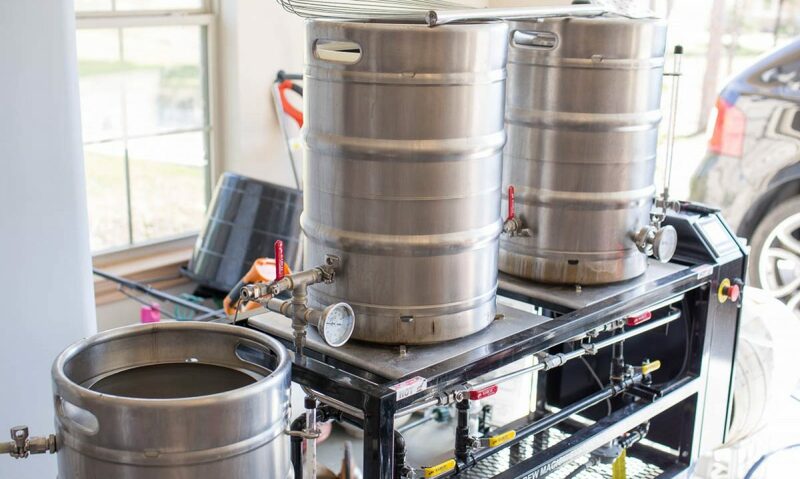 The longer whirlpool arm accommodates 5-6 gallon batches as well as full batches.